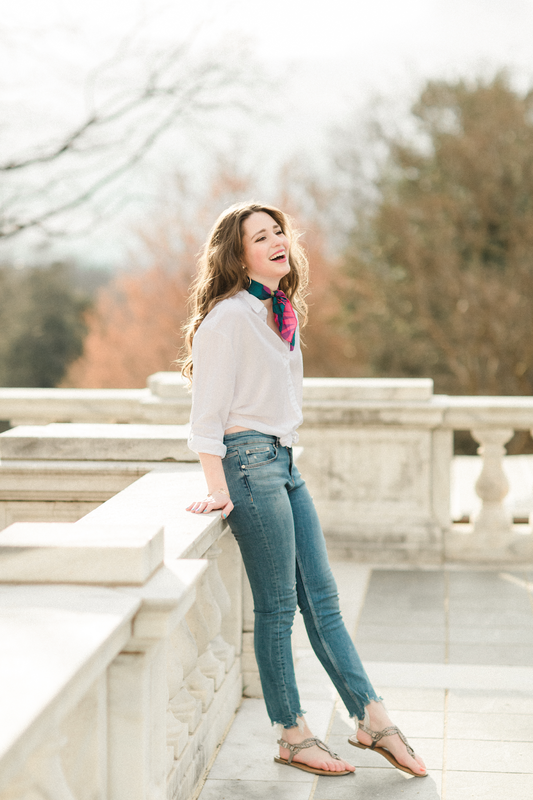 Tie-Waist Shirt + Neck Scarf = Two Spring Trends To Love! Finally sharing the last found of photos from an early spring shoot with Meredith- these were taken just a couple weeks after I moved to Virginia! I definitely saved the best for last, because I am low-key obsessed with two of the trends that I'm wearing in this outfit. I'm clearly all about things that tie in today's outfit! Let's start with tie-front shirts. 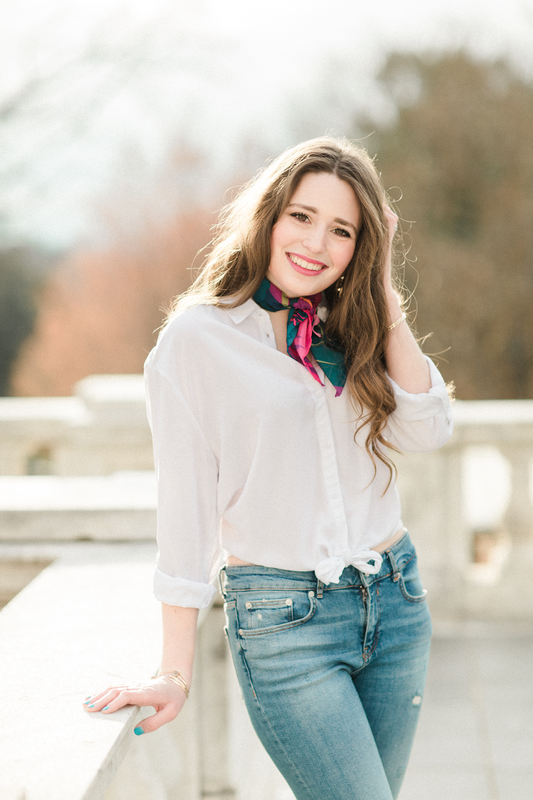 I started seeing this trend pop up in full force this winter, and I really wanted to get my hands on a white tie-waist shirt for spring and summer. I actually found the one that I'm wearing during my last shopping trip to Montreal before moving to Virginia, but this shirt is almost identical! It's not often that I purchase something that will match literally everything in my closet- but this shirt might be it. From casual jeans like I styled it here, to dress pants, shorts, skorts, and skirts- it coordinates with it all! A fun fashion discovery that I made last year: Zara is a great store to buy jeans at! They have some really unique denim styles, they're all so comfortable, and just about all of their denim is under $100. I also purchased the jeans I'm wearing here at Zara in Montreal, but I'm hoping this summer or fall to get to check out some of the Zara locations in the DC area. This pair of jeans is similar to the ones I'm wearing. 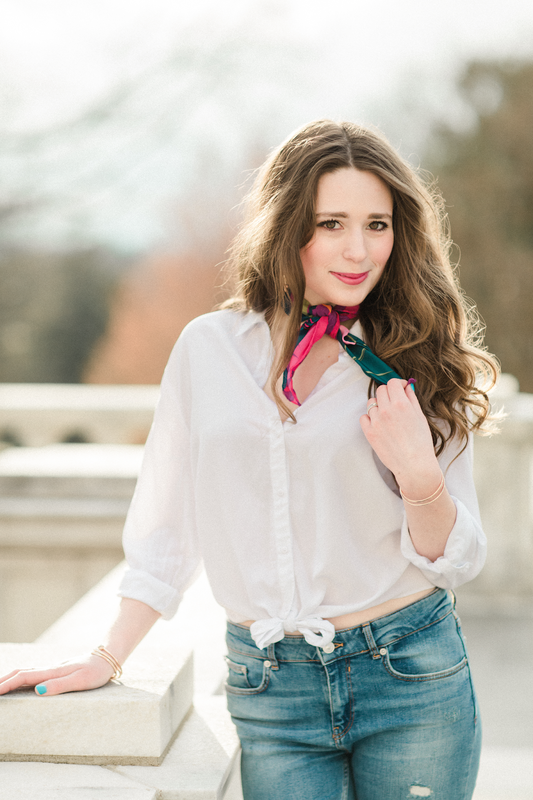 And for the other spring trend that I'm loving: neck scarves! They are such a chic way to add a twist to an everyday outfit. The one I have here is also from Zara- this one is similar though! I hope that y'all had a great weekend. Mine was just the best! One of my dearest friends, Caroline, came to visit me from Charlotte. Longtime SBIT readers might recognize her name- Caroline is one of my best friends from college and we were suitemates during senior year! She also helped take a lot of my blog photos during senior year specifically (and has quite the eye for photography). I haven't seen her since when I moved away from Charlotte- and 13 months is too long to be away from one of your favorite friends. 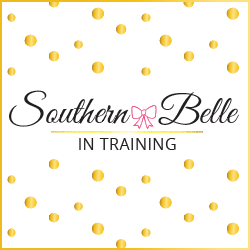 I'll be sharing more about what we did this weekend in Wednesday's post! 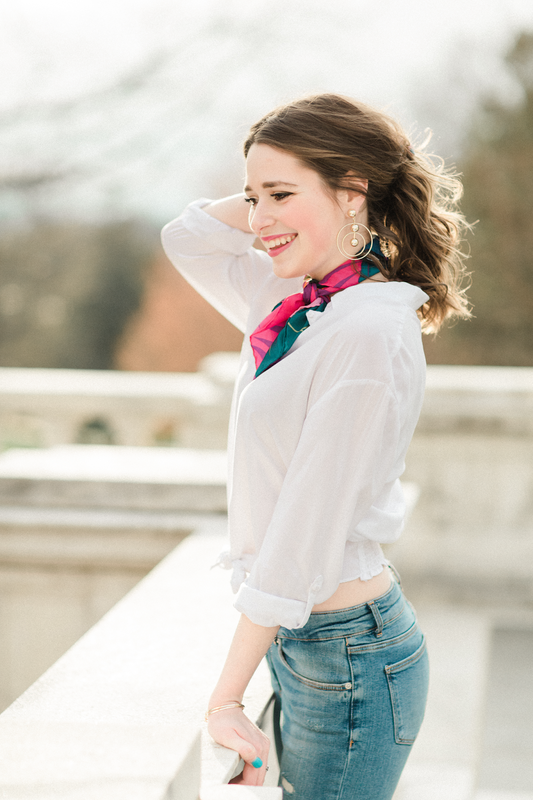 LOVE your tie-waist shirt + neck scarf combo! I just bought a few tie-waist shirts this season and can't wait to try paring them with a neck scarf. Thanks so much for sharing!!! Happy Spring :) Loving your Virginia pictures on Insta!!! This look is absolutely darling! I love the crisp button down with the colorful neckerchief! You look great here! That scarf is the perfect finishing touch, and it really elevates the entire look! This outfit is amazing on you!! I love that shirt. What a cute look! I wish I could pull the necktie look off! I am LOVING this outfit! It looks like something I’d see in France — so chic, but casual at the same time! This is a super cute and classic look! I love Zara jeans - I have at least three pairs of jeans and leggings from there! Scarves are totally your thing-- you look so cute!! I'm really loving the neck scarf trend! So cute! Oh my gosh girl!! You look so stinking cute. I am loving neck scarves this season! I especially love how they can easily double as a cute accessory to add to your handbag lol!